Step 4: Smear glue on the floor - especially the edges, paying special attention to the front edge because it will get the most wear. You don't need much glue in the center of the floor, just a bit here and there. 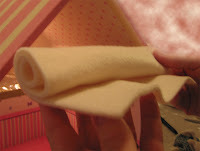 Make sure all the glue is smeared flat, otherwise with some fabrics the glue will wick clear through and create a clear "wet" looking spot on the top of the carpet. 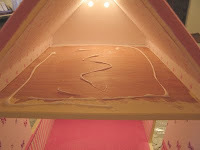 Step 5: Lay the carpet and smooth it out! Hint 1: Use an old (clean) chopstick to gently push down the corners and edges in the hard to reach back areas. Hint 2: If you are laying carpet in a room where both of your hands do not easily fit, roll the carpet up first (see picture), align the front edge of the carpet with the front edge of the room, then use one hand to unroll the carpet back into the rest of the room. This particular stuff is fleece. It works pretty good when installed this way, but can be "stretchy" which is annoying. By far the easiest stuff to work with is upholstery fabric, it doesn't stretch and stays the same size you cut it! I've used felt before and it works good, just not as soft and "carpet-y" feeling as fleece or upholstery fabric. Old flannel shirts work well too, but the fabric does tend to stretch when glued and glue can seep through. I don't like breathing spray glue, but if you want to try thinner fabrics use spray glue. 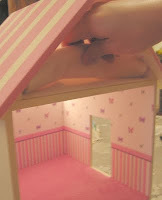 (Spray the back of the fabric separate from the dollhouse location.) Wash cloths are a good idea! I have some real carpet material that I would like to use as carpeting; would it glue down as well as the other materials? Is there a specific glue you need to use, or can you just use normal glue? Also, which is the best fabric? And where can you get that fabric from? You can use any type of glue, I prefer Alene's tacky glue. I do not think glue stick would work, but any liquid glue will work. Just don't use so much of it that it will soak through your carpet fabric :-) my favorite fabric to work with is upholstery fabric, but anything works, I have even used an old flannel shirt! Any fabric store or a Walmart with a fabric section should have some upholstery fabric as well as other flannels or soft stuff meant for blankets… hope this helps, good luck, and have fun!